All of my important classes are done for the week. It feels really good just to be able to relax. Procrastination is a cruel mistress. I was thinking about the mouth and all of its functions. How it can chew food and, likewise, be used for defense. How it can taste all different kinds of spices. How you think something and, through practice and understanding, you are able to communicate. The way a curled smile can travel from one persons soul and travel straight through another. The soft intimacy of a passionate kiss. An open passage that brings air into the lungs to keep the heart beating. Although, when you view the mouth closely, it really isn't much to look at. Go find a mirror, you'll see what I'm talking about. By the way...all men are d*cks, all women are b*tches, and everyone is crazy. The normal ones are just the ones that can hide it the best. This is just the way it is. Virtue 4: "Resolution". If you start something, you ought to finish it. This also applies to performing tasks that you ought to complete. The way I see it, you are the sum of your accomplishments. Not just creations but ideas and skills too. I'd elaborate further but I feel like I'm getting too "big picture". The bottom line...just get up and do something that you can be proud of. Virtue 5: "Frugality" Don't waste money or time if you can help it. There's only so much you get before it's gone. Which reminds me, we need another space race. I really want to see Mars terraformed by the end of my lifetime. Here is the first page of the book I did for my senior project class a few years ago. The final project was about 24 pages long; 10 of which I'm not completely embarrassed of. I saw your senior project. 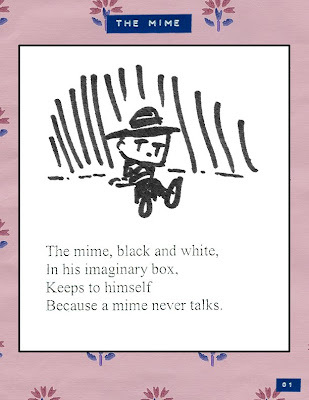 It was not embarrassing, and I remember that mime poem quite clearly. Did you do that in Lanc's class?? Anyway, you are right about mouths. Not really all that to look at but can accomplish so much!! The words for word verification are always so strange, so I'm going to include them at the bottom of comments so you can truly appreciate the genius of them.